Goodreads says, "Family can be complicated. Especially when skeletons from the past pop up unexpectedly. For American Evie Gray, finding out her deceased mother had a secret identity, and not one of the caped crusader variety, was quite the surprise. Evie’s mom had a secret life before she was even born, one that involved tiaras. In this modern day fairytale, Evie is on a path to figure out who her mom really was, while discovering for herself what the future will hold. Charged with her late mother’s letters, Evie embarks on a quest into her past. The first item on the list is to attend Oxford, her mom’s alma mater. There, Evie stumbles upon a real life prince charming, Edmund Stuart the second Prince of England, who is all too happy to be the counterpart to her damsel in distress. Evie can’t resist her growing attraction to Edmund as they spend more time together trying to unravel the clues her mother left behind. But, when doubts arise as to whether or not Edmund could ever be with an untitled American, what really ends up unraveling is Evie’s heart. When Evie uncovers all the facts about her mom’s former life, she realizes her mom’s past can open doors she never dreamed possible, doors that can help her be with Edmund. But, with everything now unveiled, Evie starts to crack under the pressure of new family responsibilities and the realization that her perfect prince may want her for all the wrong reasons." Evie Gray's deceased mother has left her a letter on everyone of Evie's birthdays, except this year it's different. This year it's more of a quest. Evie has to enroll in Oxford University (her father and mother's alma mater) and the quest will continue from there. Evie, being a clueless and American, meets Prince Edward Stuart, but has no clue who he is until after the fact. The two hit it off and become fast friends; Edward even helps Evie uncover the truth surrounding her past, which is also part of her mother's quest. Evie's feelings start to develop for Edward with the more time she spends with him and once she realizes who he is, she knows that he would never seriously date an untitled American. However, Evie uncovers the truth regarding her mother and it's a game changer for sure. 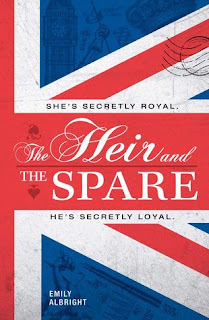 The Heir and the Spare by Emily Albright is a fun and lighthearted debut; essentially, it's the love child of The Royal We and The Princess Diaries. My favorite part of The Heir and the Spare was Evie learning more about her deceased mother and her ancestry. It's kind of cool that her mother had her embark on this life-changing quest despite the fact that she has been deceased for many years. Evie is a relatable girl next door type of character and I think many young adults will like her. She did annoy me from time to time with how she would push people away, but then again, she did have a lot of new information to process. Enter Prince Edward. He's just the "spare" in Royal family, but he's Royal nonetheless. Who doesn't love a modern fairy tale? I knew where The Heir and the Spare was going, but I didn't mind. I liked the predictability and the bubbly quality to this story; it's just what I needed. Although The Heir and the Spare wasn't as good as The Royal We, it still held my attention and I rooting for Evie from the get-go. I knew we would get our happy ending and I couldn't wait to get there. So, if you are looking for a frothy sort of read to curl up with this winter, check out The Heir and the Spare. I was hoping this would be good and from your review it sounds like it is even if it's not as good as The Royal We. Great review! I've got this on hold at the library and should be getting it soon. Sounds like it's just the sort of book I need right now to brighten up the winter blahs! It's definitely not as good as The Royal We, but it's fun nonetheless. It will definitely cheer you up and rid you of your winter blahs for sure. I hope you enjoy it. Thanks for visiting, Christina! I was curious what you would think of this one, Christina; sounds like it would be a fun, light read! Thanks so much!! It's definitely fun and light! Just what I needed at the time. Thanks for visiting, Tara! Yes, definitely check out both books...if you like PD, you'll appreciate this book for sure. Thanks for visiting, Ria!